Here is the announcement I sent out for the SCNY auction that begins this Friday evening. If you scroll down to my February 22nd entry you can see images of all three pieces in their frames. If you would like to read about the painting of "Primal" (the image on the upper left) or "Through the Arch" go to my menu on the right, hit January and go to January 12th and 17th. It will tell you a little more about them. 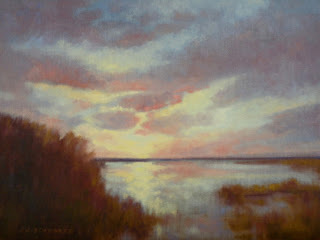 "Opalescent" was painted before I started this blog in July so there isn't anything here showing the work in progress. There are so many really beautiful paintings in this auction that I feel honored to be included. 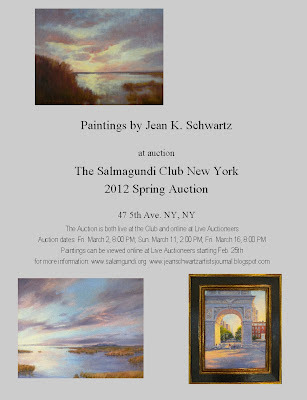 If you go to the Salmagundi website http://www.salmagundi.org/ look at the menu on the left and hit "info" next to the entry for the SCNY Spring Auction. It will take you directly to the three auction previews. Remember they are this Friday March 2nd at 8:00 PM; Sunday March 11th at 2:00 PM and the final auction is Friday, March 16th at 8:00 PM. The auction will be both live an online at the same time. You can also go directly to http://www.liveauctioneers.com/ and in the search box put in Salmagundi Club and the SCNY auction previews will be shown. I have never participated in one of these before so I am looking forward to following it! Other things on the burner besides the paintings I am working on.....This April the Art League of Alexandria is having an exhibit called "Earth, the State of the Planet". I am working along with others to find sponsorship for this show by supporting the League of 25. We are looking for 25 individuals to donate $100 each and join one of three teams competing against one another to create a sculpture from found objects provided the evening of the opening reception. The winning sculpture becomes part of the show. I have joined up and I think it will be a lot of fun. I suppose some of you will think sure, you mean it's another opportunity to make an idiot of yourself. 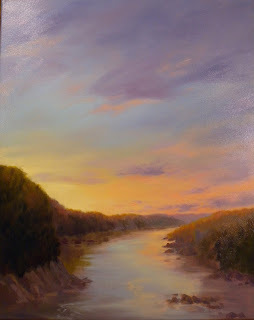 Fun is not idiocy:) I am a landscape painter, I like the earth, I don't mind helping to shine a light on the state of it. If you share my feelings perhaps you will go to this linkwww.razoo.com/story/join-the-league-of-25 You don't have to join the League and donate $100 you can click a second button to donate whatever amount you are comfortable with. I think the minimum donation is $10. Once again I will have to say I CAN'T BELIEVE THIS IS FEBRUARY! Wahoo! Another great day of painting outdoors. 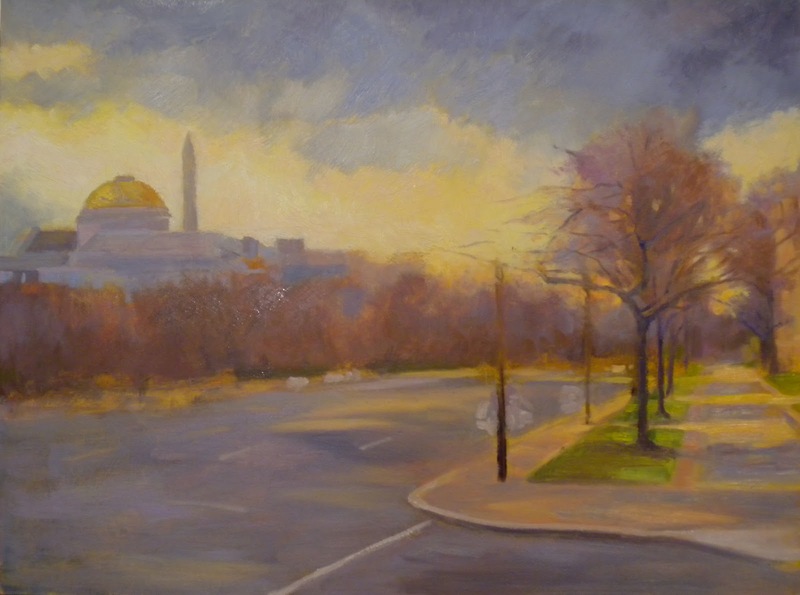 This time was with the Washington Society of Landscape Painters who paint together the last Sunday of each month. 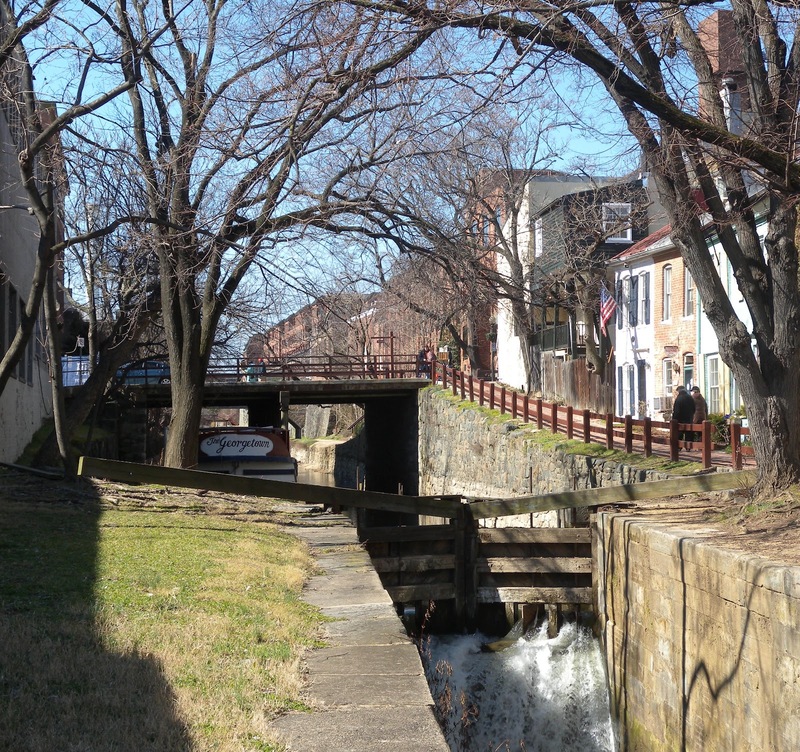 I arrived in Georgetown at about 8:45 this morning and was astonished at how quickly I found a parking place. I can tell you by 10:00 that was not the case. The day started out quite chilly but as usual I dressed in layers and was very comfortable. I will work on this during the week. There is not much to do except improve on the trees, hit the right lights and darks and add more of the shadow patterns. The lock and the cascade of water could use some improvement as well. I'll try to get to it tomorrow while it is still wet. I think this will be a keeper and escape "the pile". 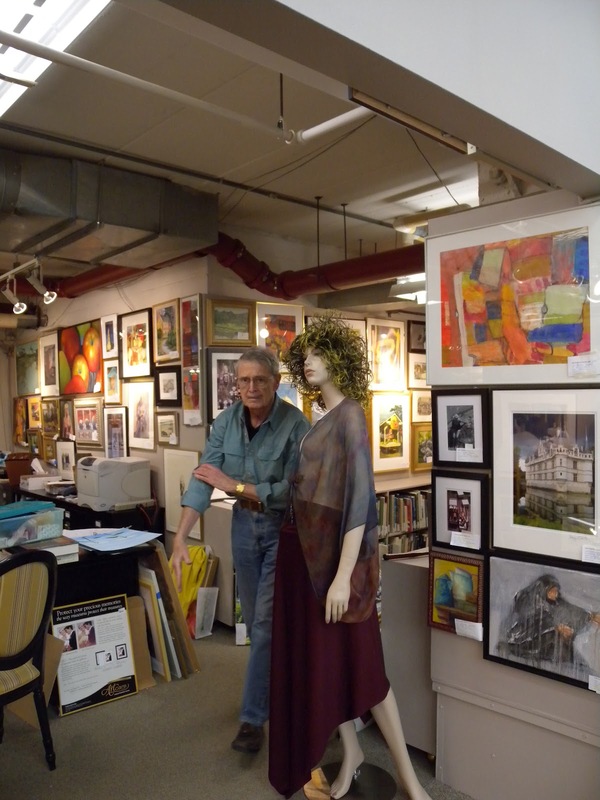 I am working on getting the word out about the Salmagundi Auction and have designed an announcement that I have been emailing to friends, family and collectors. 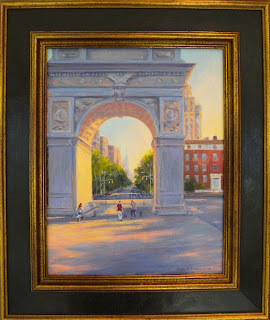 I do hope everyone takes the time to check the Salmagundi Club website and preview the auction http://www.salmagundi.org/ Just go to the site and follow the 2012 Salmagundi Auction to the auction link. You can see all the paintings there. "The Torpedo Factory Marina, February Afternoon"
Here is the finished painting from my last post. I just put more reflections in the water, put in the masts and some rigging and a suggestion of the board walk behind the boats. I am pleased with it as it captures what drew me to the scene. The crisp blue and white and all the subtle colors of the clouds and their reflections. 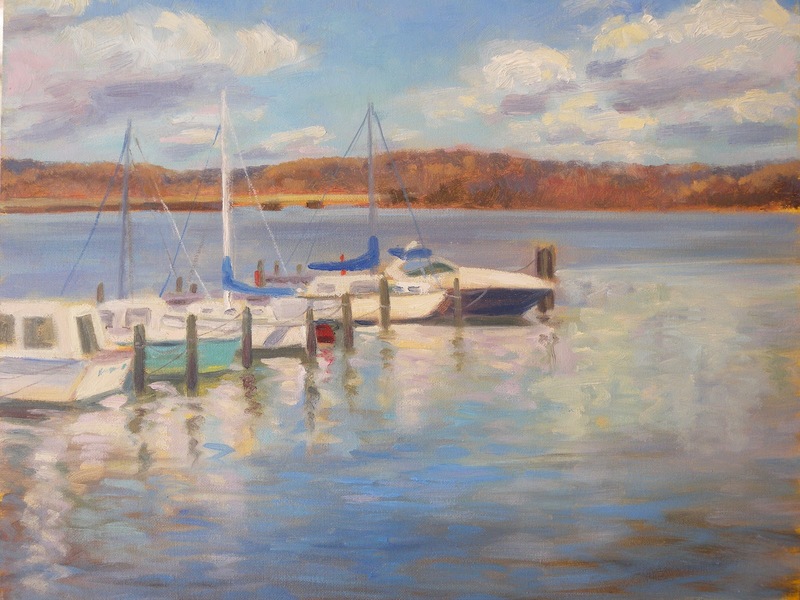 I mentioned last summer that I want to spend more time learning to paint boats and I still feel that way. Fortunately there are plenty of them around to paint! 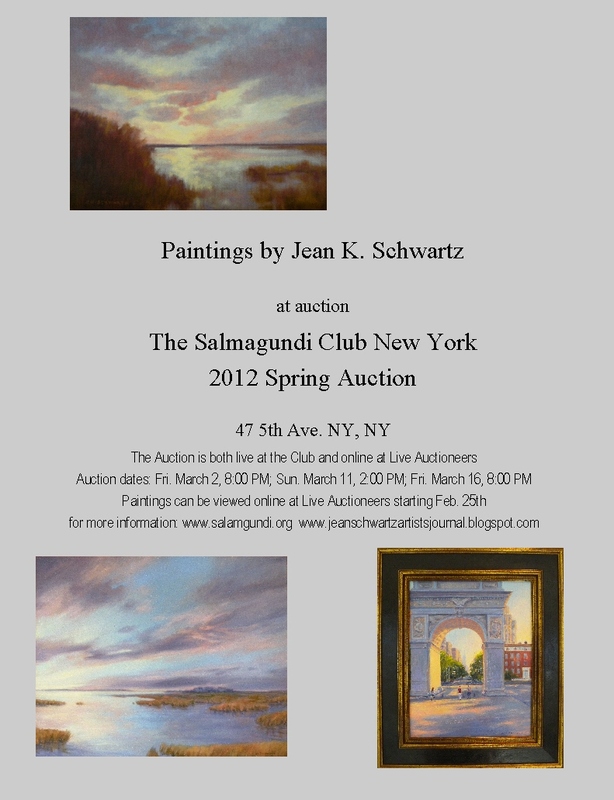 Just a reminder about the upcoming SALMAGUNDI CLUB SPRING AUCTION. 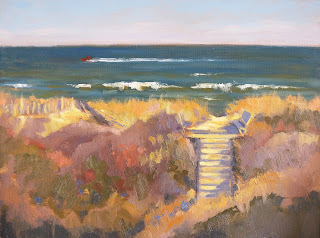 You can read my post from earlier this week or go to my website http://www.jeanschwartzpaintings.com/ and check my News page. I have the auction dates for each painting. Also I want to add that "Primal" is lot # 54, "Through the Arch is lot #81 and "Opalescent" is lot #200. 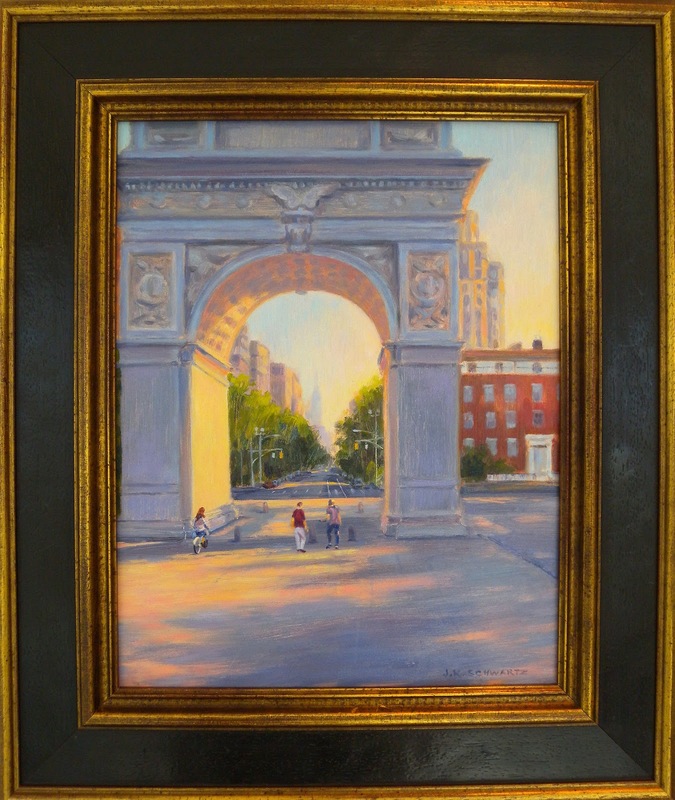 Oh, I should also mention that you can preview all the paintings if you hit this link http://www.liveauctioneers.com/ In the search box type in Salmagundi Club. The listing for the three auctions will come up. You can scroll through and see all or just go to my lot #. 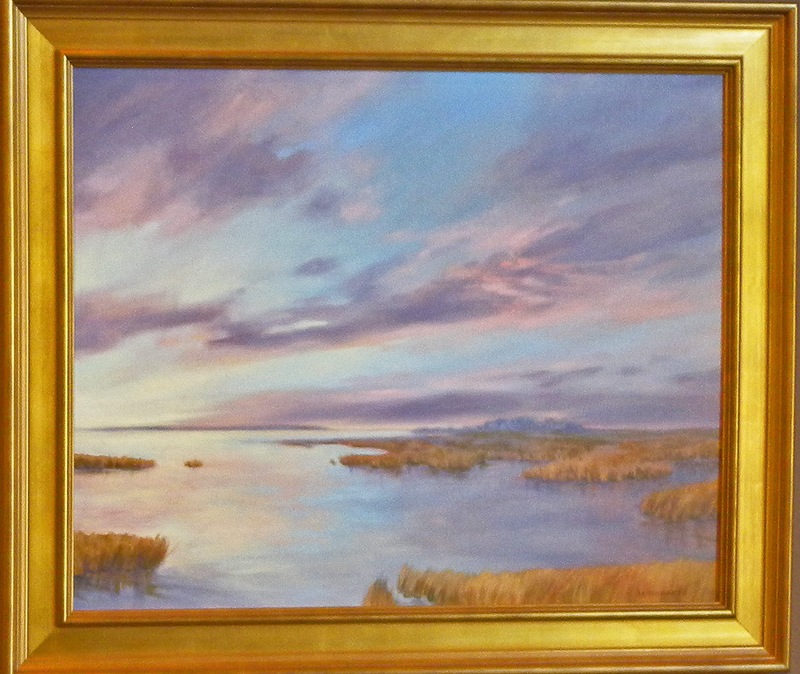 The paintings are shown both framed and unframed and you can scroll over the painting to see details. 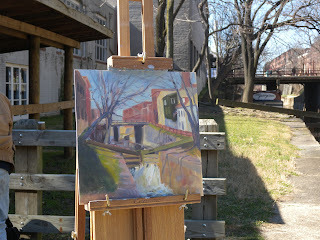 Fellow Art League Plein Air Painter Jill Banks also was out painting but opted to go beyond the dock to Founders Park. It looked like she had another wonderful Banks painting underway. I had to stop after 2 hours but I have enough there to finish the painting at home. I suppose I could keep it until another wonderful day arrives but I would really prefer to finish it while the paint is still wet. Just another hour should do it. The sky is fine and I can finish the water from memory. Some beautiful pink/gold/lavender reflections started to show in the water. Reflections from the clouds. I put a few of those color notes down where they appeared and can build on them tomorrow. 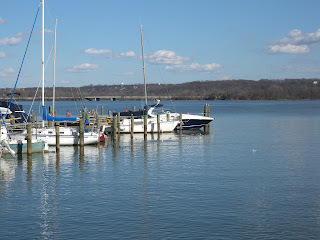 I took several digital photos because I will need to know where the masts were for the boats. I roughed in the boat locations but without the photos wouldn't know where to stick the masts and the reflections of them in the water. I stopped at the hour the when the colors were really getting rich and the shadows long and I would have liked to have stayed. 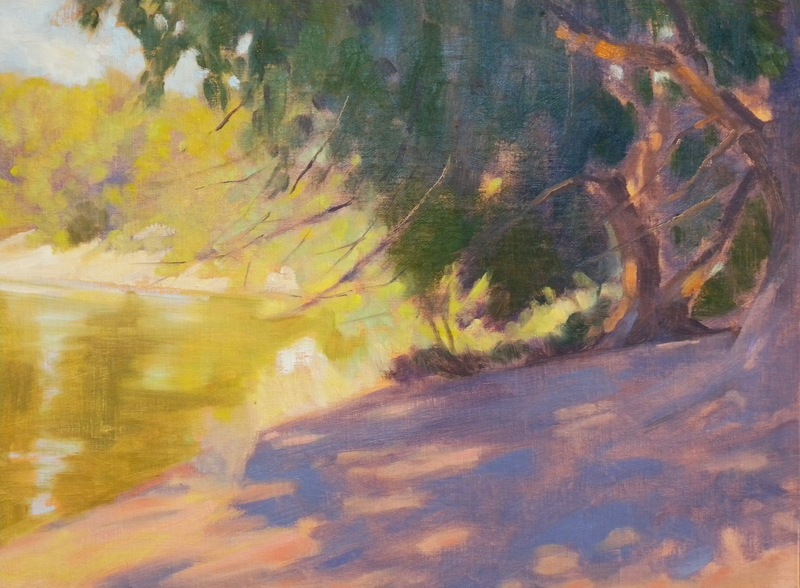 The tree I was next to began to cast dappled light on my canvas which is hard to work with. It confuses the values and colors so it made me feel less bad about having to leave. This Sunday I will be painting in Georgetown with the Washington Society of Landscape Painters and it sure would be great if we had another day like this! LIFE IS GOOD! 1st Auction: Friday March 2, at 8:00 P.M. "Primal will be auctioned off. Online you will find it by going to http://www.liveauctioneers.com/ It is lot #54. If any of you have ever had the desire to own one of my paintings or are already a collector who would like to add to those you have this is an excellent opportunity. 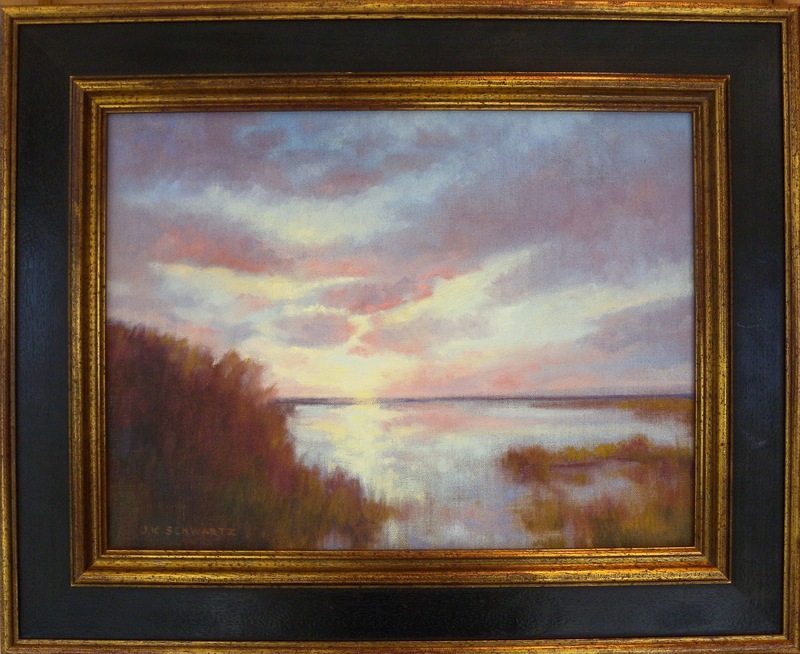 I am proud of these paintings, they are well framed and the opening bids are really low! This is a fundraiser for the Club. 50% of the sale goes to the Club the other 50% to the artist. I am also donating an additional 10% of the sale to the building fund as I am a fan of the new renovation which will restore the main gallery to its original state with an enormous glass skylight! I will be reminding you of this event in posts between now and then. I do hope you take the time to view all the wonderful works available at this event. Some 250 paintings have been selected and you can preview them all at the provided link for Live Auctioneers. 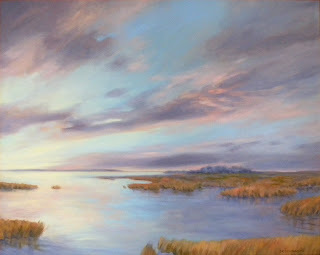 This week I am also doing the much needed update of my website so in a couple of days you might want to visit http://www.jeanschwartzpaintings.com/ to view more work. 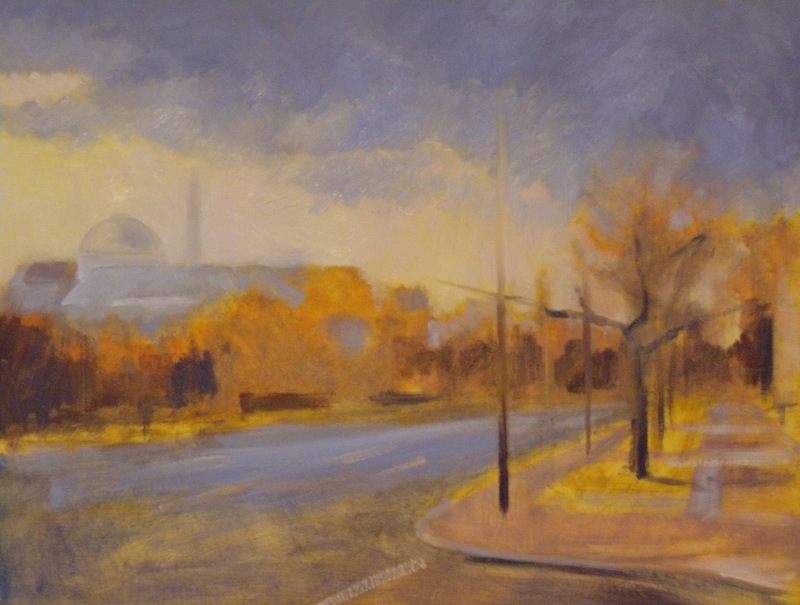 "6th and Constitution" but it was slow going because I was having a hard time getting into it. I'm not unhappy with it and I do know where it is going but I just felt that I wanted to be at the beginning of something. So, I put this aside for the day and started something new. 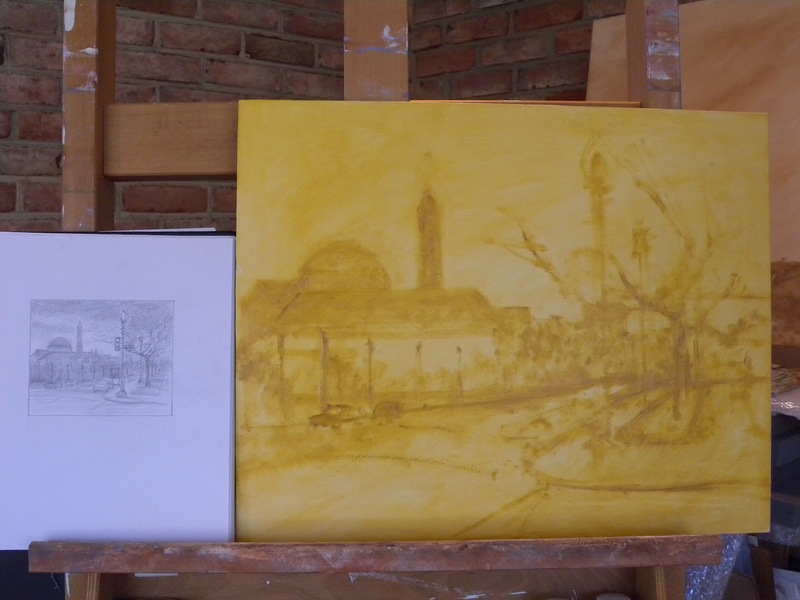 The lower image is the painting I started and would like to have finished in one session today. I ran out of daylight and could have continued under the studio lights but I felt the wiser move would be to leave it for tomorrow. It won't take long to finish. I think I am eager to see leaves on the trees again. This has been such a pleasant and easy winter but the springlike temperatures make me wish for flowers and greenery. 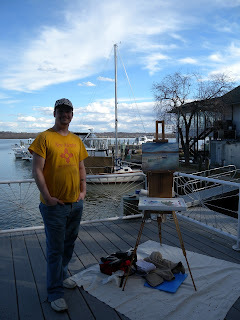 So, today I indulged myself and printed out a photo of this locale along the Potomac where I have painted several times. 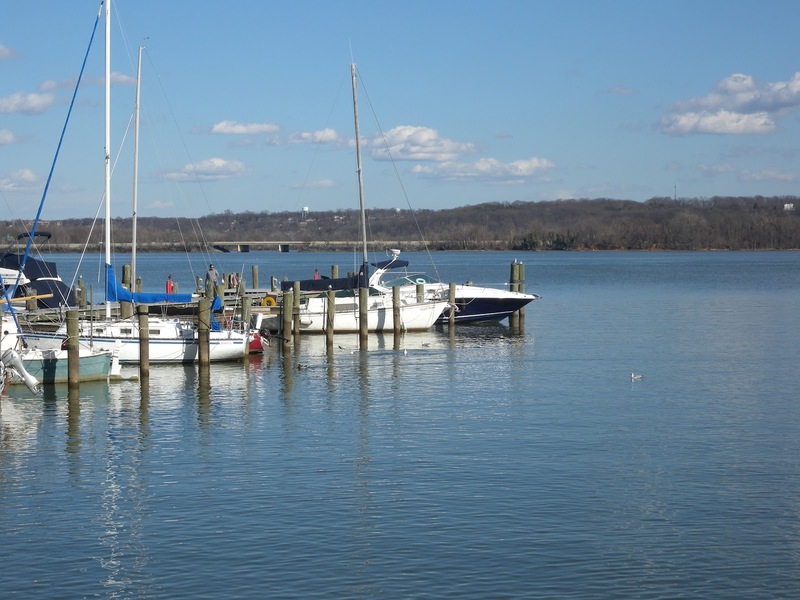 You might remember my Wide Water on the Potomac paintings. Well, this is where I was standing. If you go to my October 16, 2011 post you will see this spot in the last image on the page. It is a photo of my easel with my friends painting behind me. I was facing downriver and painted that scene but when I turned around I realized how attractive this view was. A word here about working from photographs. I think the camera is a great tool! As you know from reading this blog I am an avid fan of plein air painting but I also love working in my studio. I find I can work well from a photo I have taken especially if it is a place well known to me. I can remember the experience. It is for that reason that I don't work from someone elses photo unless it is a specific commission request. I also think it is great fun to go to Photo Shop and crop an image and see something I might have missed on site. I can then make a thumbnail sketch from it for a painting. Sometimes that is more interesting than the complete view. 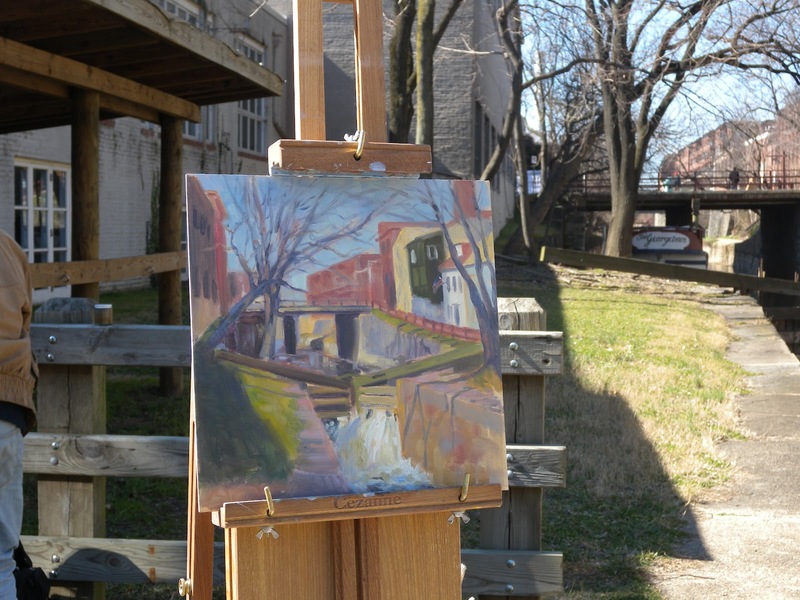 Ideally when doing studio work I have a plein air study, AND a digital photo of the subject. I don't think the camera should be frowned upon when creating a painting. I consider it a bore to replicate a photo and that does not interest me but as part of the process of creating a painting the camera can be a real asset. In my last post I showed you the paintings I had sent to the Salmagundi Club after they had been juried in for the spring auction exhibit. I now have the information I said I would have for you should you wish to view the paintings online and particpate in the auction by making a bid online. If you go to the Salmagundi website, http://www.salmagundi.org/ You will see a lovely landscape in the upper right corner and next to it it says SCNY 2012 spring auction. Click on the image and a page will come up with all the information. It will give you a link to Live Auctioneers. It will also tell you that all the works (some 250) will be on view at that site starting Wednesday February 25th. 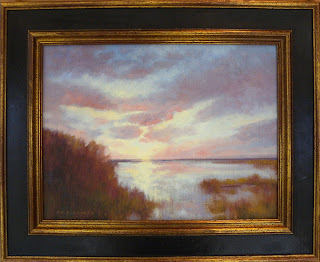 It will explain that you can bid on the paintings from that site during the actual auction dates. I am looking forward to following it. The opening bids on my paintings will be extemely reasonable and who knows, anything can happen at an auction and you may actually be able to purchase it for that opening bid. The first auction takes place Friday March 2nd at 8:00 P.M. , the second is Sunday March 11th at 2:00 P.M. and the final one is Friday March 16th at 8:00 P.M. This is the first time I am doing this and I think it will be a lot of fun! Completed Today! 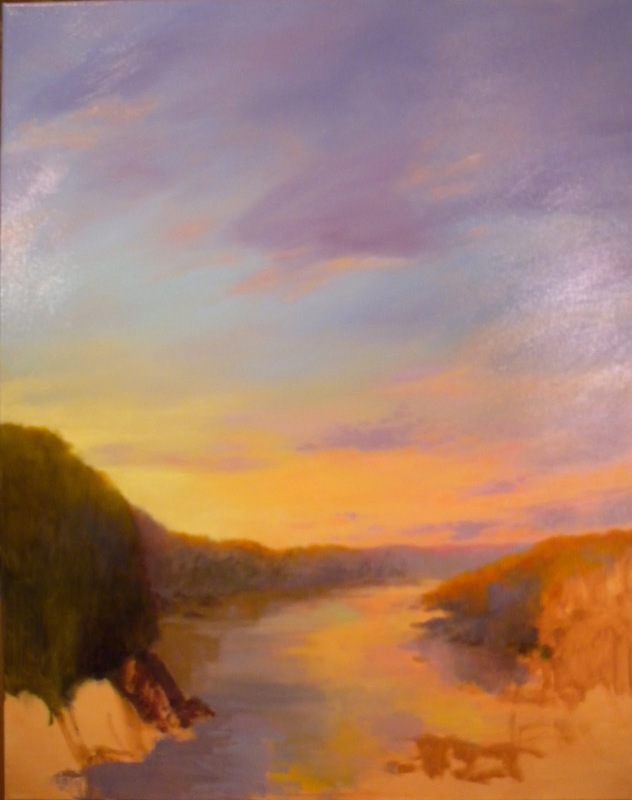 "Camelot on the Potomac"
Today was my third time painting on "Camelot" and I consider it finished. I will now banish it to the closet as is my habit. That is to keep me from constantly finding fault and picking away until I finally ruin it. There is a bit of glare on this image and it is fairly impossible to avoid since I am working under lights. Before I put this on my website I should probably take some images of it with just light from the studio windows. I think I will save it for a group show I will be participating in this June as the colors will work well with the other pieces I have set aside for that. I very much enjoy working with this palette of colors and might just do another one or two before resuming work on "6th and Constitution" whos colors now seem dull by comparison. Of course I could always liven that one up but then it would not be my original concept. Not that that has ever stopped me! 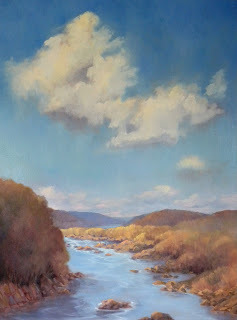 ON EXHIBIT: At the Salmagundi Club, 47 5th Ave. NY, NY http://www.salmagundi.org/ from Monday February 13th to Friday March 16th, "The 2012 Spring Auction Exhibit". Auctions will take place on Friday evening March 2nd, Sunday afternoon March 11th and Friday evening March 16th. The auctions will be both live and online. I will give instructions on this blog regarding signing in for the auctions and you can also read more information on the Salmagundi website as linked here. The three paintings below are those that are on exhibit prior to being auctioned off. This is a fundraiser for the Club and prices will be very affordable should you be interested in placing a bid. I will explain more later this week after I have received the press release. Today I painted on "Camelot" for the second time and I think just one more session should do it. Sorry about the glare on the image but I photographed it at night and the studio lights reflect off the canvas. I have found my castle. I am going to transplant the Georgetown Reservoir castle and relocate it here on the Potomac north of the Chain Bridge. I wonder if anyone will recognize it. 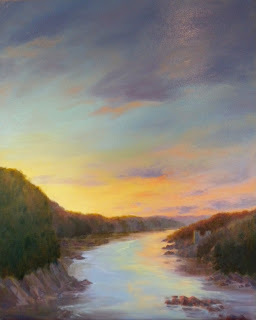 The castle is what made me decide to title the painting "Camelot on the Potomac" which seems appropriate since once there was a time when Washington was referred to as such. I am dating myself. The Kennedy administration was sometimes called Camelot. For those of you who are not from this area you might be wondering how far away from the city this spot is. The city is not five minutes away. If you were to turn in the opposite direction, take one curve more of the river you would see Washington appear as a lovely white city rising above the river and the trees. The sunset turns it to gold. It never ceases to inspire me that we have this incredible natural beauty just a stones throw from one of the world's major cities. The George Washington Memorial Parkway parallels the river on the left and there are times when I am driving home that I really have to concentrate on the road because the light show over the Potomac can be an alluring distraction. Fortunately there are a couple of overlooks to pull into to watch the show. I don't know how many times I have kicked myself for not having my camera with me. So that is why I can pull this out of my head and paint it. It has been imprinted there. 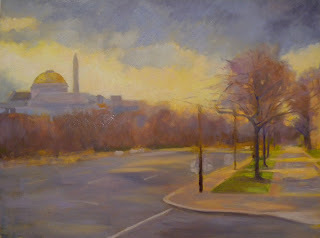 This is the new painting I mentioned having started while taking a break from "6th and Constitution". I had the same desire to paint this as I did to paint "Primal" which I posted earlier. When I move out of my comfort zone it is relaxing and reassuring to come back to what I know. 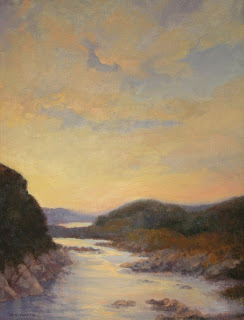 The image here is one I have painted lots of times but in this painting I am taking liberties with the lay of the land. You know, "artists license". The view is looking up river from the Chain Bridge. 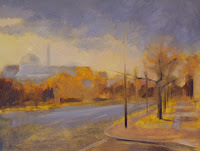 Below I will show you a couple of my paintings that acurately represent the view. I live about half way up the Virginia palisades on the left on the opposite side of the road that parallels the wooded curve. I am painting on linen that I have coated with an additional coat of gesso letting the brush marks show. 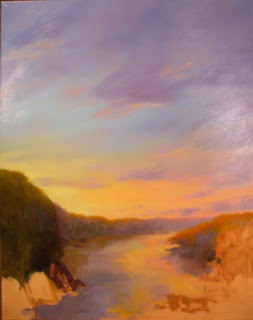 I then tinted the canvas with yellow ochre. Next, I just got to work from memory and used my own paintings as reference points. I just had the desire for rich, intense color and unabashed Romanticism. I have begun suggesting a ruin or castle on the right and will have to look around town for something to model it after or just make it up. This is just great fun. Last year a painting like this would be considered small for me but this year a 30x24 is about as large as I plan to go. Like I mentioned in an earlier post, it's an economic consideration. I already feel like starting another one with slightly different colors. Maybe the gray winter is getting to me? 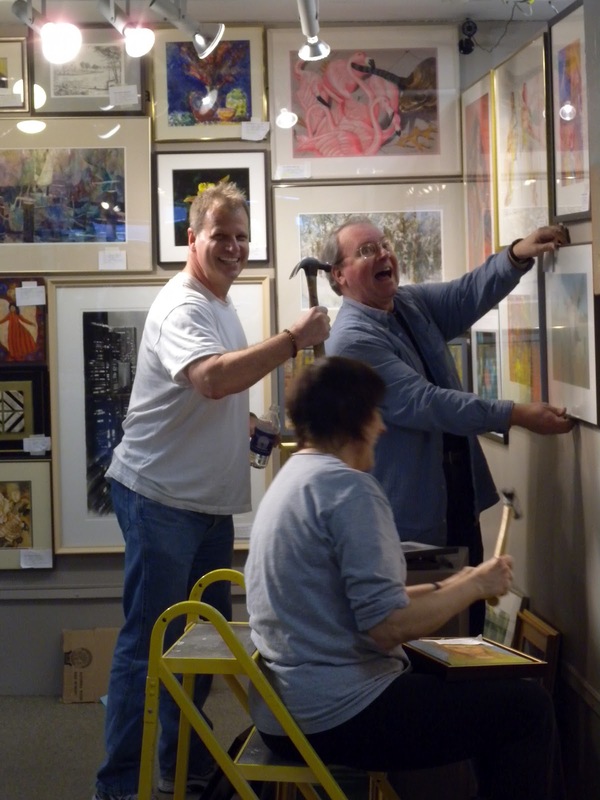 It is February and once again time for the Art League of Alexandria Virginia's annual fundraiser, THE PATRON'S SHOW! This year marks the 45th. I have been hanging this show for years (not 45 of them) with much of the same wonderful crew. I got home two hours ago from the first day of hanging and we really did an incredible job! We started at noon and worked until 5:00 and we already have about half the show up. 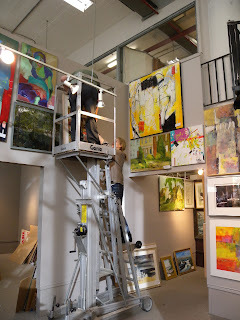 Volunteers will be coming in to continue hanging the rest of the week and works will continue to be donated. I am betting there will be around 600 works available. 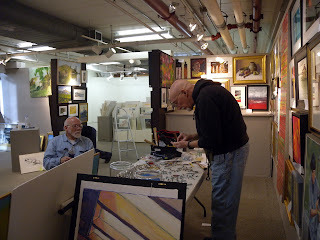 How it works.....donations of works of art are outright donations on the part of the artists. Patrons can buy a ticket for $175 which guarantees they will walk out with a work of art. All works donated must have a value of at least $175 and many works are valued in the thousands. Tickets went on sale in mid January and almost immediately sold out. There is a lengthy waiting list. Those lucky enough to have tickets will be coming in all week to make a list of their favorites so when their number is called they know what work or works they want to claim. 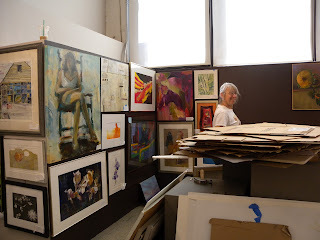 The day of the actual Patron's Show event, when the drawing takes place, they have to pay attention because if one of the works they have on their list is claimed by someone else first they must cross it out and hope they can get their next choice. This is one of the hottest tickets in town and people have been known to sleep outside in sleeping bags to wait for the tickets to go on sale. Now THAT is an art lover! I am still working on "6th and Constitution" and have also started a new painting of the Potomac which I will show you in tomorrow's post. I haven't painted since Sunday because yesterday I was involved all day with framing and packing the paintings I shipped to New York for the auction at the Salmagundi Club. I will post images of those paintings and tell you how to participate if you are interested in making a bid on any of them. The auction will be both live and online. Now for a cup of tea and an evening of rest! Working on "Sixth and Constitution"
While I was working on "Lovers Stroll" I was also working on this 16x20 painting that I have already titled "6th and Constitution". This is an intersection I have crossed hundreds of times over the years. What you see on the left is the Museum of Natural History on the Mall in Washington DC. Behind it is the Washington Monument. What you don't see is the National Gallery of Art which is off to the left. 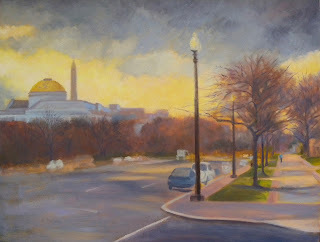 I had just left the Gallery and was rushing across Constituion Avenue at 6th street to meet friends at the Capitol Grill on 6th and Pennsylvania Avenue for an early dinner. The inspiration for the painting was the heavy, dramatic sky with the brilliant light below the clouds. There were narrow, strong shafts of gold hitting the pavement and there were some wonderful lights and darks. The day was very cold and blustery and pedestrians were leaning into the wind and holding coat collars up tight to their necks. I was one of them. As I crossed the avenue I held my camera high and got some good reference shots from which I put together a sketch for the painting.